We’d love your help. 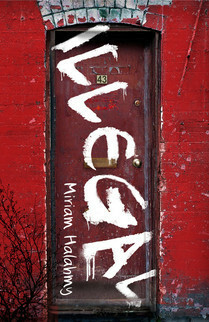 Let us know what’s wrong with this preview of Illegal by Miriam Halahmy. 'Illegal' is the story of a teenage girl, driven to take desperate measures when all other choices are taken away from her. It is a touching, surprising and painfully honest story. To ask other readers questions about Illegal, please sign up. Recommends it for: All Contemp Lovers Who Love Gritty Fiction And Amazing Characters! Ever since baby Jemma died, Lindy's family has fallen apart. Her brothers are in prison and her parents spend all their money on alcohol and gambling. Until she finds an unexpected ally in the new boy: strange, mute Karl. With his help, can Lindy escape the web she is Ever since baby Jemma died, Lindy's family has fallen apart. Her brothers are in prison and her parents spend all their money on alcohol and gambling. Until she finds an unexpected ally in the new boy: strange, mute Karl. With his help, can Lindy escape the web she is caught up in? When you've done what she's done, is being truly free ever an option? I love emotional contemps, so when Miriam asked me to review this, I couldn't say no! And Illegal did not disappoint! Emotional, powerful and addictive, it had me hooked from page one. It dealt with difficult topics like drug dealing brilliantly, and created a story with amazing and a believable plot. I adored Illegal, and can't wait to get my hands on Hidden and Stuffed (Books One and Three). Lindy Bellows was a really troubled girl who had too much responsibility, too young. She was tough, putting on a brave face, but she was drowning. And she was all alone. Her vulnerability broke my heart, and made me just love her to pieces. She'd lost so much, so she didn't really want to let people in and was scared and untrusting of the ones she did let in. She was so vulnerable and broken inside that it was impossible for me NOT to love her. Karl Reece was strong and cute and sweet and caring and darn irresistible! To begin with he never said anything, but he spoke volumes with his eyes, eyebrows and face. I loved him! He'd been through so much, and was so clever and oh-so-cute with his "I-love-facts-voice"! I loved the relationship between Lindy and Karl: it was so natural, so sweet, so real. I just loved seeing how Lindy's thoughts of Karl changed as she got to know him better, going from thinking of him as a "retard" to feeling terrible for ever thinking that. They were so different but so alike and when they were together, I just felt it. They were perfect. Garth Bellows, Lindy's 19-year-old brother, was someone I couldn’t figure out to begin with. He was meant to make everything better for Lindy, but he got her the job with Cousin Collin. But he really came through and tried to look out for Lindy, even from prison. He was so caring and reassuring and made me and Lindy feel safe. Cousin Collin Bellows, drug dealer. He was a shady character, tricking Lindy, lying, wheedling his way into everyone's good books. I agreed with Lindy: he was "totally insane". Jess... When I first 'met' her, I thought she was a total cow: she was horrid to Lindy, vindictive. But towards the end, I started thinking that she wasn't too bad. I think her character can be expanded on... And guess what! After meeting Miriam, she confirmed Book3, Stuffed, will be about Jess: Squeee! Can't wait! Lindy's family was really dysfunction and broken. Her dad was addicted to gambling, always down at the bookies. Her mum was empty, broken, never doing anything. Her big brothers were in prison, and her younger one was innocent and young and always hungry. And baby Jemma was dead. Although the family wasn't perfect, they were a family. And I could feel it, especially in the very last chapter. I'll miss the Bellows! I really loved little Sean - he doted on Lindy, worrying if she wasn't in... he was terrified he'd lose her too. He was so clever and so cute and I just loved him! A huge theme in this book is loss. Both Lindy and Karl lost someone, and it affected them both hugely. Friendship is another, especially in the unlikeliest places, and about being able to let people in and trust them after having loved and lost before. This in particular, I think Miriam did beautifully. The writing was brilliant: raw, emotional, powerful. Told in third person, it still really let me get into Lindy's head. I felt everything she felt, saw everything she saw. And it was authentically teen. It was simple, yet emotional and powerful. Just the way I like it! And the plot was brilliant and compelling, unlike anything I've read before. I've read ones with drugs in, but not ones like this. Not with characters I fell in love with the moment I met them and had me glued to the page so I could find out how it all ended. Although I had a vague idea about what the plot would be like, I really didn't see the twists coming. I loved every second! I just adored the setting. Hayling Island sounds beautiful, and I loved getting to see the huge variety of people who live there. All the little facts and places on the Island just made the story feel all the more real to me. I can't wait for my next Hayling fix! This is the second book in Miriam's Hayling Island cycle and it's every bit as powerful as the first. Fast paced, exciting, and so tense that you almost can't bear to read on, yet you have to. Lindy, the protagonist, is a brilliantly drawn character - both complex and naive - and it's a joy to see how she grows. Highly recommended! A great teen read that explores family relationships, identity and mutism. You'll be rooting for Lindy throughout! Ever since baby Jemma died, Lindy’s whole world has fallen apart. Her two older brothers are ‘’away’’ in a Young Offenders’’ Institution, her dad gambles his life away; her mum has lost her job and wanders round the house doing nothing and her younger brother Sean who is only nine years old, relies on her for everything. Even Lindy herself isn’t ‘’normal’’. She is the loner and freak of the school. Bullied and taunted she has taken it upon herself to grow a spear nail for protection and, in secr Ever since baby Jemma died, Lindy’s whole world has fallen apart. Her two older brothers are ‘’away’’ in a Young Offenders’’ Institution, her dad gambles his life away; her mum has lost her job and wanders round the house doing nothing and her younger brother Sean who is only nine years old, relies on her for everything. Even Lindy herself isn’t ‘’normal’’. She is the loner and freak of the school. Bullied and taunted she has taken it upon herself to grow a spear nail for protection and, in secret, she cuts herself. When Lindy first cut herself I thought I would freak out when I read about it but I didn’t. I just felt painfully sad that for some people, it’s a reality. They don’t just read about self-harm, they harm themselves. Lindy blames herself in a way for her baby sister’s death and thinks there is only one way to deal with it, to cut herself and relieve herself of the pressure and let ‘’all the bad Bellows blood’’ flow out of her body. Lindy isn’t happy with who she is, she feels like she doesn’t belong and likens herself to Hamlet after her teacher says he was a spiritual refugee after his father’s death, ‘’not fitting in at home anymore’’. I felt desperately sorry for Lindy but at the same time I was proud of her. For being strong, for being calm and for coping so well with the shattered remains of her family lying about her like jagged pieces of glass. So when her cousin tells her he has a job for her she takes it, glad of a distraction and relieved that she will finally have some money of her own, even if she just spends it on food for her ever-hungry younger brother. But she’s soon dragged into an even worse world of terror and secrets: her cousin is a drug dealer and he has a few things in mind for her to do for him. She’s already in way to deep to escape so what can she do but obey and hope for the best? After reading about Karl’s story I put the book down and just sat there. Shocked and appalled by what he had revealed. Imagine having your best friend die a terrible death and then not having anyone to talk to about it and pour your emotions out to anyone. His parents literally shut his voice out of their world, they weren’t interested in what had happened and they didn’t want to know. So finding no reason to talk, he stopped. After all, nobody listened to him so why should they realise? Or even care? From the first word that Jess uttered I disliked her. She was such a bully, and she took pride in how horrible she was, waiting for the right time to be mean to Lindy so that everyone was watching. As the book went on though I my feelings for her started to change and we realise that she has problems in her own life too. Colin: the slimy, evil drugs dealer, Lindy’s cousin. He found a way to get Lindy to work for him and took it, not caring whether it would hurt her or not. Every time he thought she was wavering he would remind her that “you’re the one that I want,” knowing that that was all Lindy ever longed for, to feel wanted, to be appreciated. I loved her little brother Sean, he was so small, vulnerable. The only one that really cared fully about where she was and what she was doing. He was always worried about her and constantly hungry – I felt sad that he had to grow up so quickly and not even have a stable house to live in with food in it to quench his appetite! Illegal explores feelings of loss, loneliness, bravery and the power of friendship. It shows how it can only take one person to change someone’s life for the worst, and only one person to turn someone’s life around for the better. The book handles serious issues with a light touch that make the book even more powerful and emotional and will stay with you for a long time after the last page has been read. Ever since Jemma died Lindy's family has been falling apart - her mum has lost her job and started drinking, her dad spends his time gambling away the little money they have and her older brothers are both in the young offenders institute. Lindy is trying to hold things together for her younger brother Sean but quickly finds herself in deep trouble. Offered a job by her cousin she sees it as a lifeline but soon ends up caught in an international drugs ring completely unable to see a way out. Som Ever since Jemma died Lindy's family has been falling apart - her mum has lost her job and started drinking, her dad spends his time gambling away the little money they have and her older brothers are both in the young offenders institute. Lindy is trying to hold things together for her younger brother Sean but quickly finds herself in deep trouble. Offered a job by her cousin she sees it as a lifeline but soon ends up caught in an international drugs ring completely unable to see a way out. Sometimes help comes from the most unlikely sources though and when she befriends the school outcast, a mute boy called Karl, she begins to feel hopeful that she might escape. This is the second book in a cycle of three novels set in Hayling Island. I have a bit of a soft spot for this series as Hayling Island isn't that far from where I live, so I find I can totally related to the setting of the books. It feels like I am reading about a neighbouring village. The author clearly shows there is more to a UK coastal village than fairground rides and an ice cream hut. Real life occurs there,just like everywhere else, when the tourists go home, people still have to live th This is the second book in a cycle of three novels set in Hayling Island. I have a bit of a soft spot for this series as Hayling Island isn't that far from where I live, so I find I can totally related to the setting of the books. It feels like I am reading about a neighbouring village. The author clearly shows there is more to a UK coastal village than fairground rides and an ice cream hut. Real life occurs there,just like everywhere else, when the tourists go home, people still have to live there. I love how each book is linked to the other but can be read as a stand alone. There are no cliff hangers waiting to catch you out. I read Hidden last summer, which I really enjoyed, so I was really pleased to be given the opportunity to read this one. Lindy, the main character in Illegal featured briefly in Hidden last year. Her appearance in the first book, didn't really allow you to warm to her. She came across in the first book as being a bit of a bully. However in this book, you get to see the whole picture and realise that Lindy is only tough when she has to be. Her life has been quite traumatic for someone so young and she has shouldered a lot of the burdens of her family, as her parents crumbled under the death of her little sister and her brothers are banged up in jail. Lindy is a fighter, and she is just fighting to survive. You can see why she is taken in by her cousin, Colin, to begin with, as she is desperate for money just to make sure her little brother eats. I loved Karl! From the first mention of him, I had a soft spot. He was written so beautifully; so different to Lindy, yet they were so right for each other. They meant so much to each other, they needed each other to grow and survive; like the medication they needed to breathe freely. This book is bursting with realism; there is no fun and fantasy here, just real life at it's most grittiness. The author really knows how to tackle difficult and often delicate subjects, making them accessible to the YA market. I actually think this book is more dramatic and intense than the first. It was like watching an episode of The Bill - no nonsense, no messing about - the author tells it like it is. Illegal is the second in Miriam Halahmy’s series of books based on Hayling Island and after reviewing Hidden back in October I was really keen to get my teeth into Illegal. It did not disappoint. Illegal deals with some seriously adult issues, which at times had me wondering if it was indeed a YA book but it deals with them in a mature but readable way which I think is part of its charm and well, genius. Illegal, you soon realise how hard life is for Lindy and her family. From the loss of her brothers to prison, to her baby sister passing away, Lindy has for too much to deal with for a young teenager and this is compounded when she begins to work for her dodgy drug-dealing cousin Colin. Lindy thinks she’s doomed to the Bellows fate of being sent to prison and never getting out and continues her work for Colin as she has no way out. Through her time spent working for Colin, she gets to know Karl, ‘the boy who doesn’t speak’ from school and she begins by bullying him as she has done everybody else but Karl sticks around. His character is extremely interesting as he begins to open up and both Lindy and we as readers get to know him better. Lindy knows she needs to free herself from Colin and her jailbird future and with Karl’s help; she begins to hatch a plan. This novel is fantastic, truly enjoyable and Lindy shines as an unlikely protagonist and shows herself to be truly genuine and likeable. I really enjoyed getting to know Lindy and empathised with her difficult and near unmanageable life. Dealing with grief, family issues, social services and darker issues including drug dealing, Illegal is a fantastic tale of how you don’t have to fall into the traps laid out for you and you can make more of your life if you want to. A brilliant novel which left me anticipating the third in the series. Lindy Bellows is fifteen and has a car-wreck of a family. Her two older brothers are at a Young Offenders Institution and since her baby sister, Jemma, died of meningitis five months ago her parents have been no use to anyone. Lindy is plagued by guilt, blaming herself for Jemma's tragic death as she tries to take care of her younger brother, Sean, and hold her dysfunctional family together. Constantly teased at school by posh girl Jess who calls her 'Benefits Bellows,' Lindy is in turmoil and a Lindy Bellows is fifteen and has a car-wreck of a family. Her two older brothers are at a Young Offenders Institution and since her baby sister, Jemma, died of meningitis five months ago her parents have been no use to anyone. Lindy is plagued by guilt, blaming herself for Jemma's tragic death as she tries to take care of her younger brother, Sean, and hold her dysfunctional family together. Constantly teased at school by posh girl Jess who calls her 'Benefits Bellows,' Lindy is in turmoil and although she seems hard on the outside, she is hiding more than just emotional scars. When she lands a job working for her cousin, Colin, she soon finds herself caught up in his criminal activities. Lindy is in trouble. She longs for her older brother Garth and ex-boyfriend Liam to rescue her until she encounters Karl, a mute who is labelled a 'retard' at school. Could he be Lindy's unlikely saviour or will she be dragged deeper into Colin's illegal world of crime and drugs? This second instalment in Halahmy's south coast cycle, cleverly uses the major characters from Hidden in the guise of minor characters in this book, giving Lindy Bellows, the bully from book one, an opportunity to tell her side of the story. I really loved Hidden and I'm glad to say that Halahmy retains all the atmosphere, realism and conflict of that first instalment in this impressive follow-up. Illegal is always entertaining, insightful and unflinching. I was surprised at how much I enjoyed this YA novel. It tackles difficult topics in an effective way, and it made me laugh and feel like crying at times. I wanted to wave a magic wand and make everything better for some of the characters. i really like how much drama is in this book. i was never bored and found it very hard to put down. My cycle of three Young Adult novels, HIDDEN, ILLEGAL and STUFFED are published by Albury Books and are available in both paperback and ebook. HIDDEN was nominated fo I have been writing since childhood and started with poems, stories and diaries. I taught myself to play the guitar and wrote songs. I have published short and long fiction for children, teens and adults and three poetry collections. My cycle of three Young Adult novels, HIDDEN, ILLEGAL and STUFFED are published by Albury Books and are available in both paperback and ebook. HIDDEN was nominated for the Carnegie Medal and was Sunday Times Children's Book of the Week.